Rev. 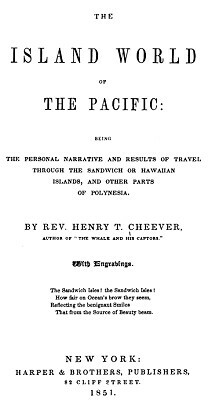 Henry Cheever : Surf Riding at Hilo, 1851.
and Other Parts of Polynesia. Harper & Brothers Publishers, New York, 1851. Extract from Life in the Sandwich Islands, A.S. Barnes and Co., New York and H.W. Derby, Cincinnati. 1856. Pages 66 to 69. At the other end this magnificent avenue opened upon the deep, with a beach of the finest black writing sand, over which the sea rolled in immense hoary breakers, nearly up to a wall made to prevent its incursions upon the kalo patches. Boys and girls, and athletic men were sporting among the billows, diving through the huge rollers as they rushed in from the ocean, and sometimes riding in upon them clear up on the beach, the boys and girls on little surf-boards, the men by dint of their own muscles. Geoff Cater (2012) : Rev. Cheever : Surf Riding at Hawaii, 1851.